When the new board is inducted on Thursday, it will kick off the longest period of time that all seven board members will be working together — a full three and a half years — in the entire 164-year history of the largest school district in the country that has an elected board. But can they all get along? Not only will this new board shift in a pro-reform way, but it will skew younger. And there are big challenges for the second most populous school district in the nation, which faces looming bankruptcy and underperforming test scores. The board members, veterans and newcomers alike, said they want to generate a spirit of cooperation in this long period that they will be working together. 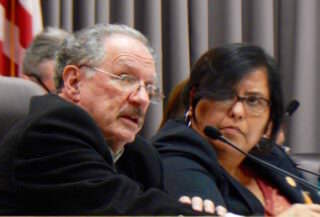 George McKenna sits next to Mónica García on the horseshoe. That means that the recently elected members — newcomers Nick Melvoin and Kelly Gonez — and Mónica García, who was re-elected this spring, will serve extra-long five-and-a-half-year terms through December 2022. The school board staggers elections so that there isn’t a sweep of new members all at one time. García is now set up to forever hold the record as the longest-serving school board president in LA Unified history and one of the longest-serving board members, having been elected first in a special election in 2006. Los Angeles voters imposed term limits on the school board in 2007 to four-year terms and three terms total, with a maximum of 12 years, under Measure L, and in 2015 the elections were synced with other elections so there wouldn’t be costly single-issue elections. So this will be García’s fourth and last time around, and if she remains through all of it, she will have served 14 and a half years. Julie Korenstein holds the record for longest-serving board member, at 22 years. It was an ugly campaign this time around, García acknowledged, with the ouster of board President Steve Zimmer by Melvoin with an unprecedented amount of money spent in the race. The third Latina to be elected to the school board, García also holds the record of running the school board as president (a total of six years, and she said she doesn’t want it again). It is a mostly ceremonial position chosen by the seven board members every year. 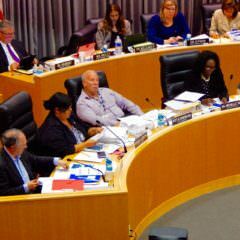 In an informal poll of the new and past board members by LA School Report, all seemed very interested in wanting to working well together and working with — and keeping — Superintendent Michelle King. The only board member who didn’t speak about the new board dynamics or this recent election was Scott Schmerelson, who will be the lone Republican on the board. Schmerelson contributed the maximum amount he could to Zimmer’s campaign. But Schmerelson did give an indication of what he thought about the board he has worked with when he spoke in a public meeting to a group of parents in the San Fernando Valley earlier this year. “I’m warning you, they can be a mean group of people, some of the meanest I’ve ever dealt with,” Schmerelson said. The board members sit in the Beaudry headquarters auditorium in a semi-circle dubbed “the horseshoe.” They are seated in order of their board district numbers, with George McKenna of District 1 on the far left and Richard Vladovic of District 7 on the far right. The president moves to the center seat. García now sits between Schmerelson and McKenna, a black board member who often tells stories about growing up in New Orleans in the segregated South and acknowledges his Creole heritage makes him very light-skinned so people don’t realize he’s black. García endorsed and helped campaign for opponents of both Schmerelson and McKenna, and sometimes their heated discussions on the board are directed specifically at each other. Ref Rodriguez is seen to have a lock as the next school board president, thus he would move to the center seat next to Superintendent King. That would put Melvoin, Gonez, and Vladovic together on the right of the horseshoe. Generally, the monthly board meetings last full days, sometimes as long as 14 hours, and meals are eaten on the horseshoe as the public meetings drone on. Who he’s going to sit next to played a big part in why Vladovic didn’t endorse anyone in the race to replace Mónica Ratliff, who left the board in June after a failed run for Los Angeles City Council. “I truly enjoyed working with Mónica Ratliff because she really did her homework,” said Vladovic, who for the past few months has had patches on his face and forehead where skin cancer was removed and said he may have more before the end of the year. Vladovic has yet to have an in-depth conversation with Gonez, who will sit next to him, but plans to before the board gets into full swing in the fall. He has talked to Melvoin though. As a former history teacher, Vladovic said he doesn’t want to dwell on the past but learn from it and move on. The most contentious issue by far in the school board race was charter schools, and the newcomers were elected with a record amount of charter money. McKenna, Schmerelson, and Vladovic have spoken with great concern about how the proliferation of charter schools could hurt the district because funding is funneled away from their budget. The district already has more charters than any other district in the country. 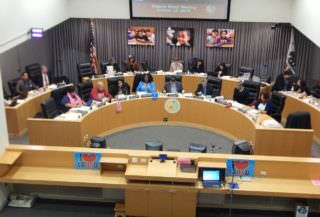 Charter schools are public schools that have more autonomies than other district schools, and although many are overseen by LA’s school board, they can offer different styles of educational programs and do not have to hire employees who are part of the many LA Unified-affiliated unions. Just like McKenna and Vladovic were endorsed by both UTLA and the charter advocates, newcomer Kelly Gonez has the unique experience of teaching as a district teacher represented by UTLA and also working at an independent charter school. The second-largest school board in the nation overseeing 734,641 students, including 107,142 independent charter and 69,867 adult education students, will now have a board with only one board member who is a parent. Vladovic’s two children not only went to LA Unified schools but also work for the district. Five of the new board members have worked at LA Unified at some point, three have worked at charters, four have worked as administrators, and three have unseated an incumbent (see chart). Two board members, García and Schmerelson, ran against the same candidate, Carl Petersen, in the past. Petersen ended up supporting and campaigning with Schmerelson against Tamar Galatzan in 2015. Two board members worked in former President Barack Obama’s administration — Melvoin and Gonez — and García has attended past Democratic national conventions. 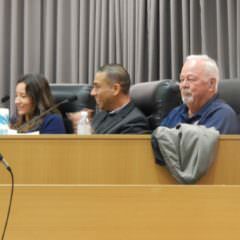 Two board members — García and McKenna — came to the board through special elections. Two of them, Vladovic and García, will be termed out after they finish this term. A majority of the board members will serve full time, at a salary of $45,637, which corresponds to a beginning teacher’s wages. Melvoin and Gonez plan to be full-timers on the board, even though both their predecessors took part-time salaries. García and Rodriguez have been part-time, getting $26,347 a year. Some of the members have been involved for more than three decades with the district. Vladovic this year celebrated his 50-year anniversary in education in the Los Angeles area, and McKenna first started as a math teacher with the district in 1962. Three decades ago Denzel Washington played him in the movie “The George McKenna Story.” Schmerelson started at LA Unified as a teacher 32 years ago and was an assistant principal and principal at several schools. Most of the board members have master’s degrees, and two, Rodriguez and McKenna have earned doctorates, like King recently did from USC. Most of the board members are fluent in Spanish. Schmerelson taught Spanish in high school. Melvoin and McKenna admit they are not good with Spanish. Six were endorsed by the Los Angeles Times. Schmerelson was the only one who was not. Some school board members bring administrative experience from other districts. McKenna worked as an administrator in the Compton, Pasadena, and Inglewood school districts, and Vladovic was superintendent in West Covina. Pro-reform candidates have dominated the school board in the past, most recently in 2010 when García presided as president. García also presided when the board included six women in 2007 — Vladovic was the only male. And, of course, it could happen that one of the board members decides to run for another office, say a state Assembly seat. Or one could get recalled, though none has been since the 1930s. Melvoin said he hopes the board isn’t as contentious as it has been this past year. Melvoin said he talked with Vladovic about the district’s financial solvency and how they could work together. He also liked Vladovic’s idea of incentivizing high-performing teachers to go to low-performing schools. The board’s unified opposition to Trump administration policies and Education Secretary Betsy DeVos could do that. “The threats from the federal government will bring everyone together on the board,” Melvoin said. Ref Rodriguez in tears as he says goodbye to Moníca Ratliff. One of the mantras that García repeats is that “it takes four votes” to get anything done. Now that there are four pro-reform members, she thinks it can help move forward some of her ideas that have been stymied in the past. Rodriguez, who mended bridges with Zimmer after unseating Bennett Kayser in a hard-fought race two years ago, also acknowledged, “Yes, with four votes you can find support more quickly.” But don’t expect a sudden proliferation of charter schools, he said. 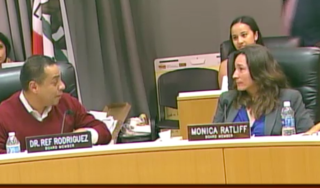 At a celebration of her service at June’s board meeting, a teary-eyed Ratliff noted how she loved sitting next to “wise” Vladovic, and her “new friend” Rodriguez, who replaced Kayser who was also a mentor of hers. Weaver also announced that Academy Award-winning director Ava DuVernay (“13th” and “Selma”) is picking up a documentary being made about Zimmer. The crew was filming the speeches at the meeting last Tuesday. Ratliff at her last meeting. Four votes, of course, could end King’s contract, but the board in June voted to extend it for an extra two years to help solidify King’s position. At the moment, there seems to be no momentum to change that. * Corrects that Julie Korenstein is the longest-serving LA Unified school board member, and adds that Measure L set the term limits.